Shadipur is a crowded, largely working class, locality in west Delhi adjoining the industrial districts of Naraina and Kirti Nagar. Its narrow streets perpetually crowded with autos, two-wheelers and rickshaws are lined with endless shops, eateries and hawkers. Down its narrow alleys are houses that seem to touch each other and allow nothing wider than a scooter or motorbike to pass through. Manmeet Singh, better known as "Lucky", leads me down one of these alleys where the noise of the street recedes and sunlight is cut off by the overhang of closely built brick and cement houses. He unlocks a steel door and ushers me into his 10 by 20 feet workshop. The little windowless workshop is crammed with carefully bundled stacks of wood of various species. He collects different types of wood, and lots of it. 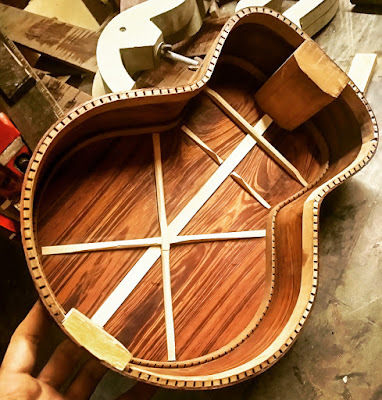 For, Lucky is a luthier; at 23, he is perhaps one of the country's youngest and already a pro known for his finishing skills. 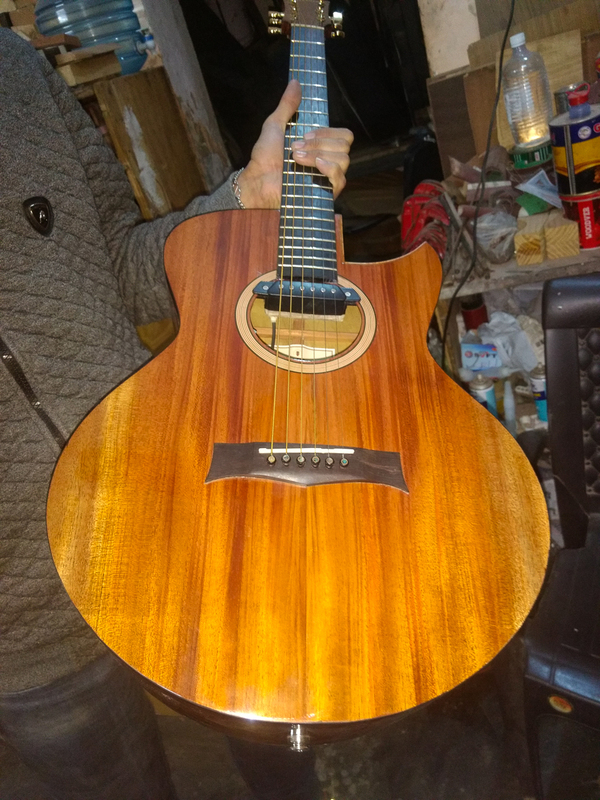 He got into guitar making after his mother accidentally broke his guitar. "I repaired the guitar and liked the process", recalls Lucky. 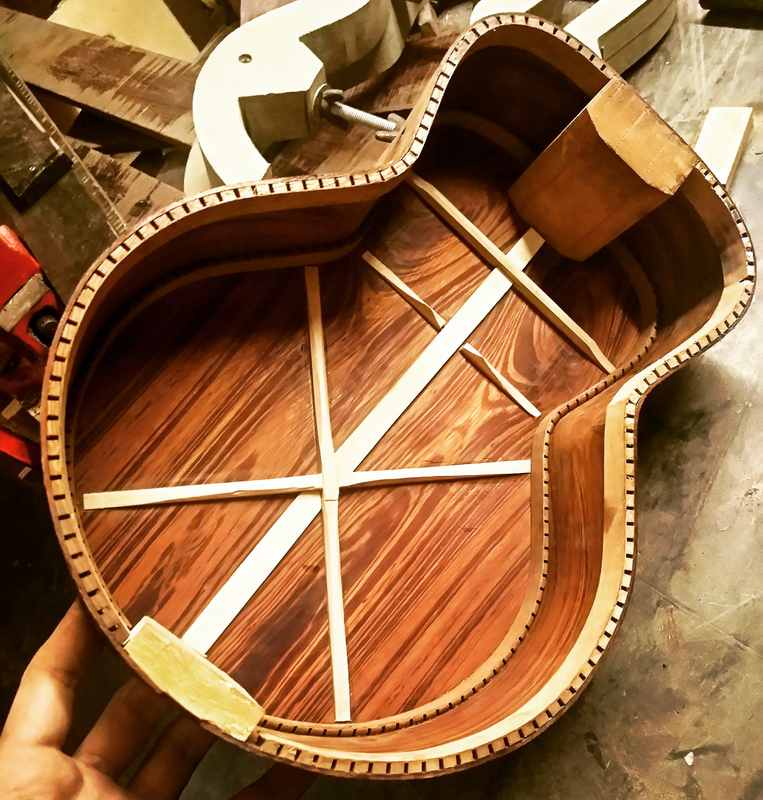 "I first began to repair guitars for local music shops and then started making them." He has been making guitars for just 3 years and already his basic models of acoustic guitars sell for Rs 25,000. 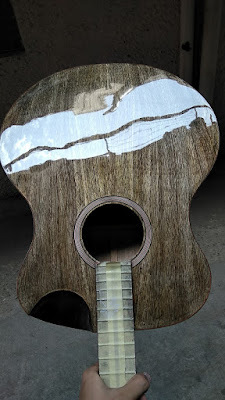 He makes one or two guitars a month and supplements his income by taking up spray finishing work and procuring exotic local varieties of wood for guitar makers and wood suppliers. The first part of the process is to acquire great wood, he explains. "You cannot finish something that is not great in the first place", he explains in Hindi. This is one reason why he spends a lot of his time - an average of three days a week- at the city timber markets. At Kirti Nagar timber market near where he lives, everyone seems to know Lucky. He dives into the shops to quickly inspect what is available. If something catches his eye, he is instantly on to it. 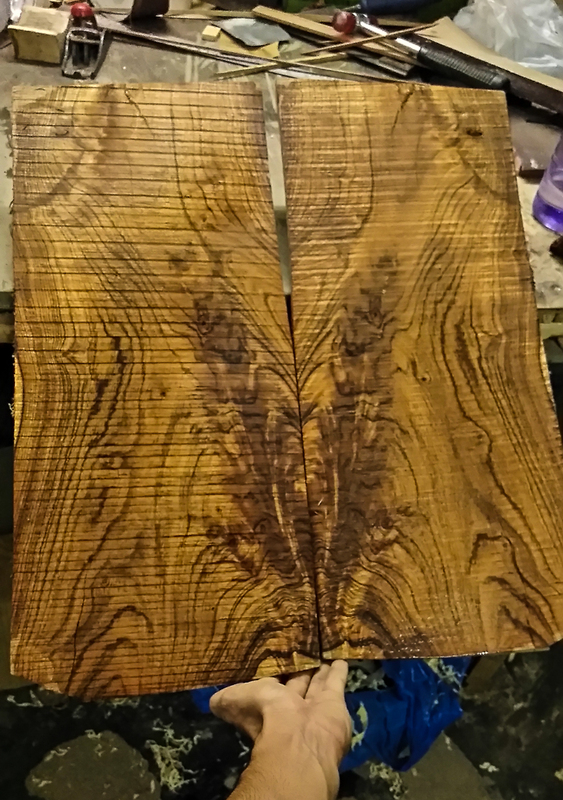 At one shop, we came across a couple of logs of a local timber called Jungle Jalebi. I later learnt this wood is Pithecellobium dulce also known as Monkeypod. It is dense and difficult to saw. Lucky thought one of the logs would produce some great burl. He snapped a few photographs of the log and sent it to one his mates in Mumbai who exports exotic Indian woods for guitar makers around the world. The reply came back almost instantly and in the affirmative. The next thing I know Lucky was fishing out money to reserve the log for re-sawing later. "Two or three of us share the wood I find", Lucky explained. "That way I can get what I want without having to block a lot of money for an entire log." 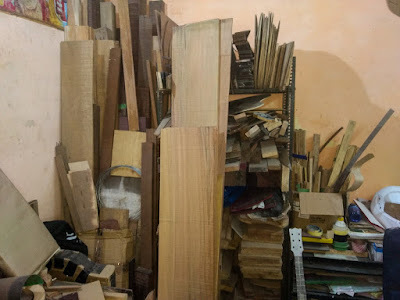 This way, he has managed to build up a small but impressive collection of a wide variety of wood, including Purpleheart, Cocobolo, Black Siris, Mango, Indian Mahogany, Sapele, Bubinga, Spanish Cedar and so on. 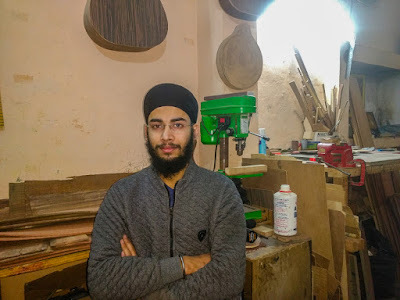 He gets the wood cut into quarter inch thick pieces and brings them back to his workshop where he uses a shop made drum sander to bring them down further to a final of 2 to 3 millimetres. The pieces are cut into various shapes and joined together with thin splines. The sides are moulded in forms of various shapes and sizes made of MDF. The neck is made separately and later attached to the body. Where he excels is in the finishing. He has an air compressor spray system at home and does the finishing there in a veranda as his workshop is too tiny and enclosed for spraying. 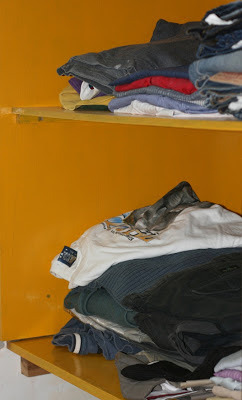 He also has a shop made buffing machine which uses various types of cloth wheels. "The glow in the finish comes from depth", he says. "The only way you can know it has worked is from seeing the final product. If there isn't enough depth in the finish, then it isn't done." The best thing I liked about Lucky was his insatiable curiosity about different kinds of wood, finishes and work methods. He keeps visiting the larger paint dealers to know about the latest kinds of finishes, paints, fillers and so on. He seems to be constantly absorbing information. 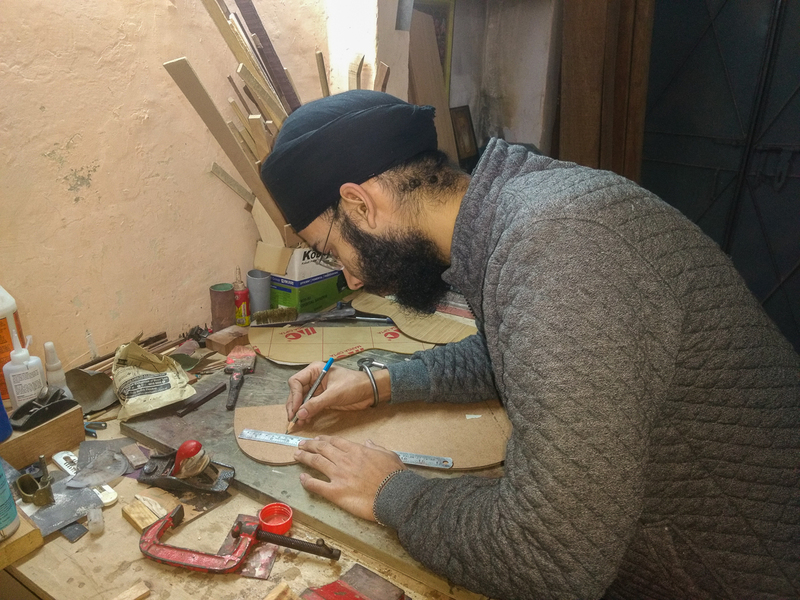 A self-taught guitar maker, Lucky Singh seems to be vastly enjoying the learning curve he is on. His insatiable curiosity about everything involving his art will ensure that he grows to be a great craftsman someday soon. Very nice to hear about this. Wish him all the best! Please keep the stories about local craftsmen coming! 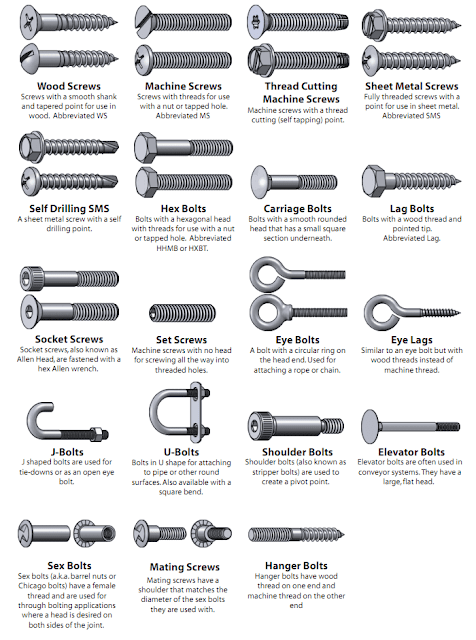 Very nice information. We occasionally ignore indian species of wood(save teak ,saal ,sheesham) which we have in abandon, gets respected by westeners. 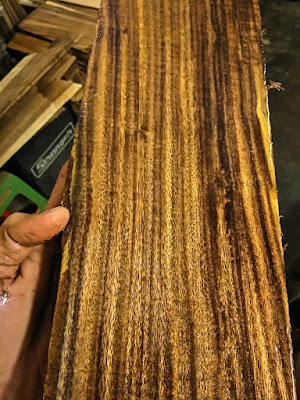 Is Indian Mahogany here identical with "Toona Ciliata" ? Good question, Kingshuk. I had the same thought. Indian Mahogany is not Toon at all but a variety of real Mahogany. Apparaently, true Mahogany grows in parts of India (mostly old growth trees) and once in a blue moon a log shows up in the local timber market. The wood is astonishingly like Sapele and I could have sworn it was Sapele but Lucky insisted it was Indian Mahogany. Price should be on the higher side. What a fantastic story. Good reporting Mr. Banerjie. May this young man thrive and prosper. Just goes to show that every now and then us parents do the right thing. Very nice writing up. I have always enjoyed his company. His knowledge of timber is quite remarkable. It's wonderful Indranil how you find hidden talent. You are the one who deserves credit for discovering Lucky. Keep it up! Thanks alot everyone for your wishes and special thanks to indranil ji for this wonderful blog. Indranil, I am a self learned guitarist, wold like to buy a guitar from Lucky. Can I have his contact details please.